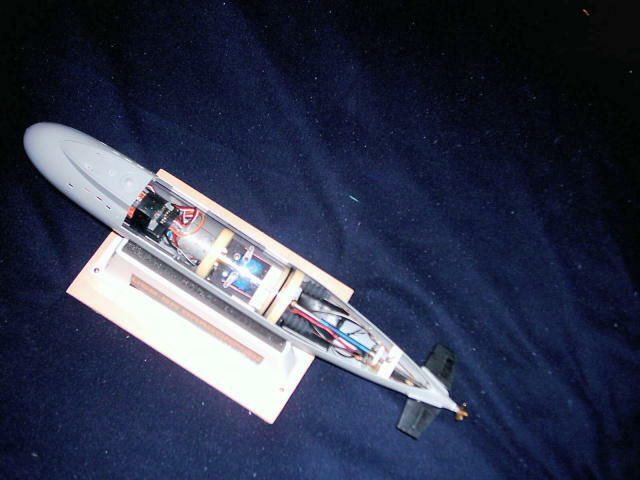 Here's another little project I've been working on for a while now...it's a 1/144th scale Trumpeter Kilo, only 508mm long x 67mm diameter and it's just 127mm from keel to the top of the scope. It's being built as a dynamic diving boat for the time being, although I may think about converting to a static dive later on. 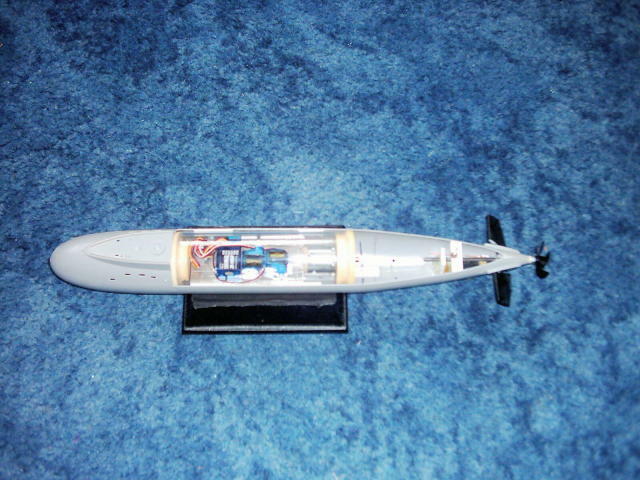 It has a 54mm id (60mm od) cylinder inside it, the rear planes and rudder are operational, although the front planes will be fixed. 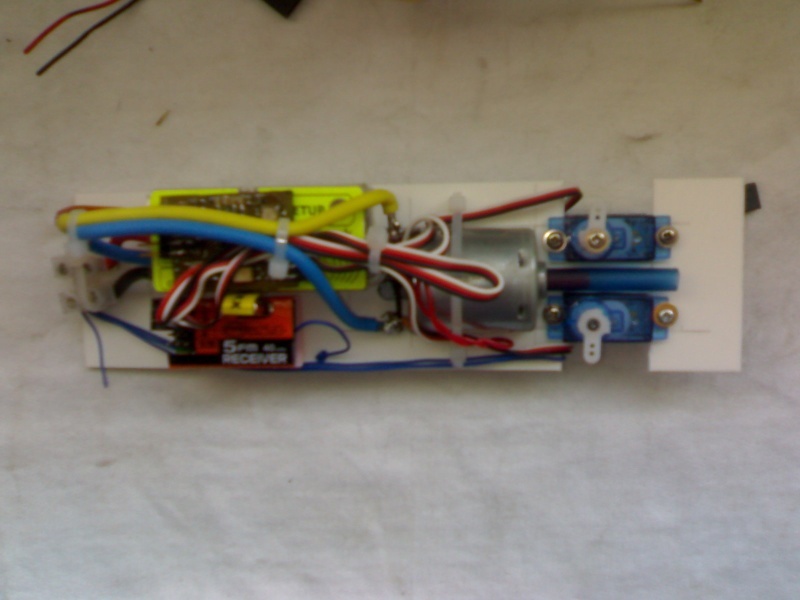 I have two MMB micro servos for it, a 6 volt Park Flyer motor with a gearbox, an Action Electronics Pico esc and a five cell 3600 a/h battery pack. 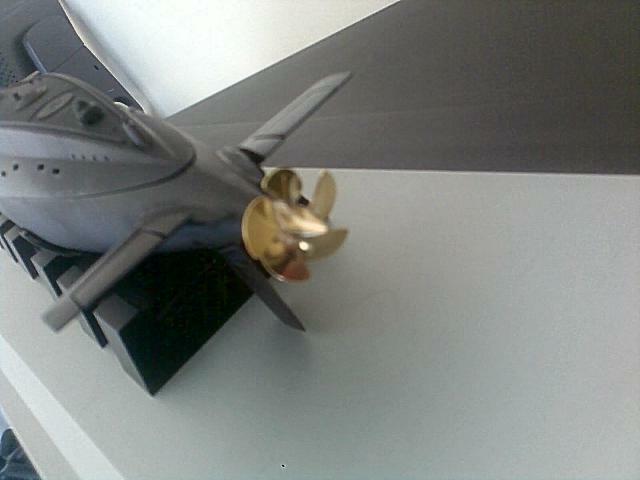 The prop is a 35mm four bladed brass one, a bit oversized, so I'll be changing that to a five blade 25mm one later on. 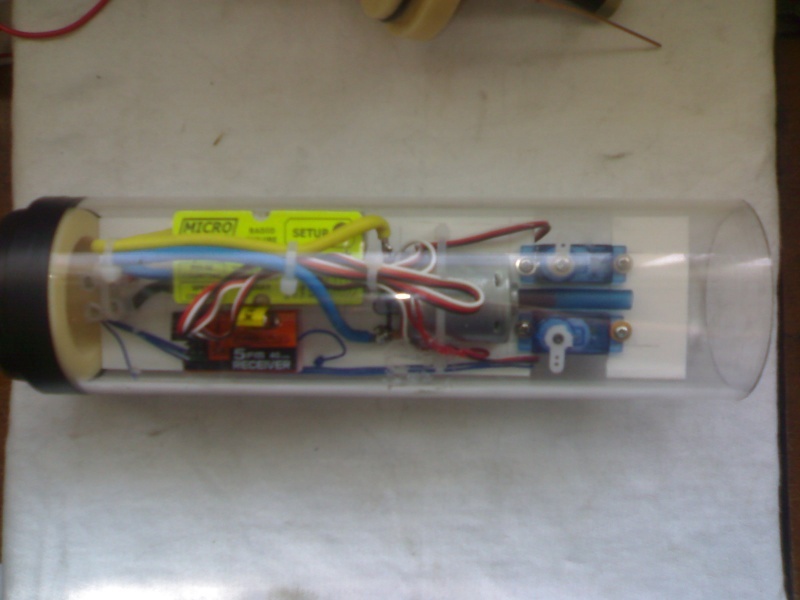 Another pic showing the geared motor, servo and rx installation. 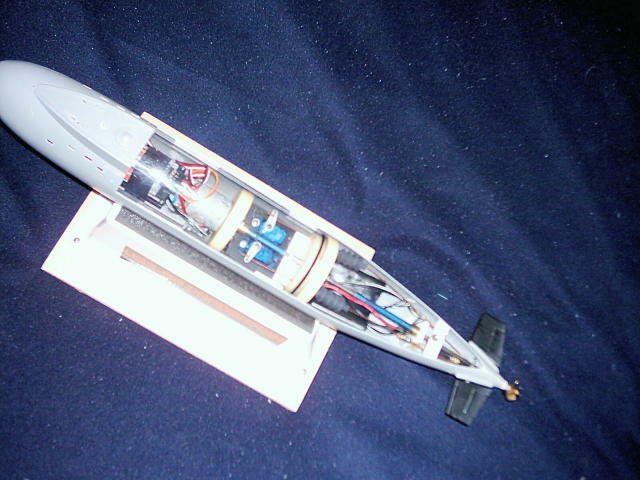 Been doing some more work on the little Kilo recently...changed the Park Flyer motor to a 280 sized one, and made a few alterations to the cylinder. It all fits a treat, there's a four cell AA sized 2600a/h battery pack under the equipment tray which runs the two mini servos, an Action Pico esc, and the HiTec rx all tucked inside the cylinder. 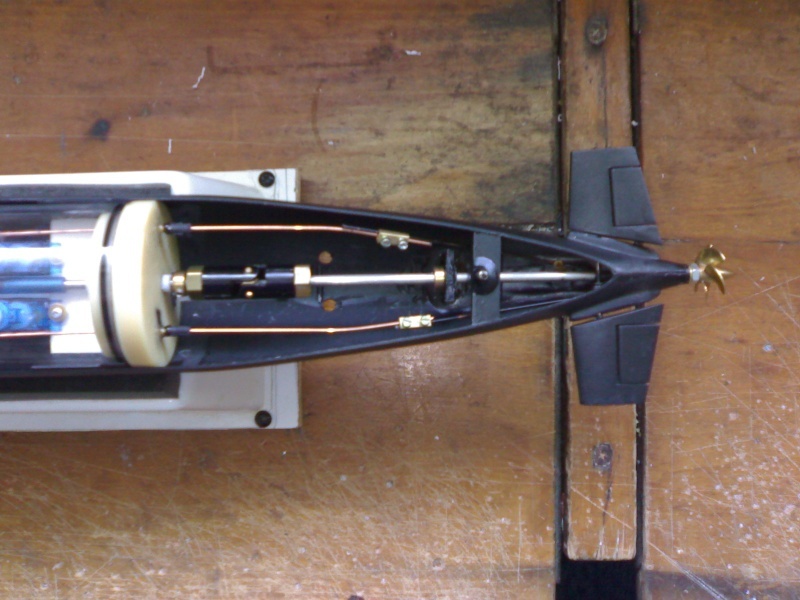 Bit of an internal change around with the Kilo, she now sports a 385 motor, run from an Action Condor esc, a new and longer cylinder which virtually reaches the nose of the boat now, I needed the bouyancy to keep her afloat. I have to make up a four cell pack of AA sized cells, they will just fit under the prop shaft, and she's about done. By heck, that was tight getting the battery pack to fit without causing the hull to bow out or the control linkages to bind, but it's all in there and it all works. Later today...the test in the internal domestic water accumulation device. I made up a five cell pack of AA 2300a/h cells earlier on, they fit right hard up in the bows, and are wedged in position with a couple of pieces of blue foam. 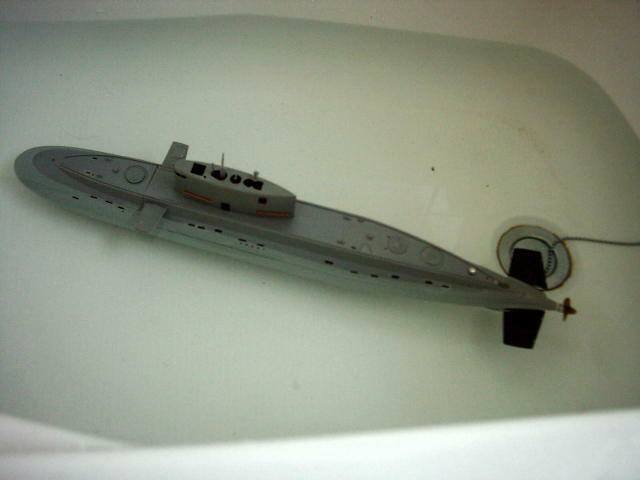 Then I decided to try the little fella in the bath...pics below, not a bad trim for the first ever time of getting wet. I was very surprised to find that she will need a fair bit more weight to trim her down to a decks awash state, I really thought I'd need to be cramming floatation foam inside the hull. Further tests were curtailed after I spotted water in the wtc...traced that to a hole in one of the rubber bellows. I hate those things, there must be a better way of sealing the push rods, surely? The Kilo had her first coat of satin black applied yesterday, just needs a quick rub down with some wet n' dry and another coat. Then a couple of details picked out on the deck, 'scopes painted, escape hatch transfers put on and she'll be patrol ready. She now has her new battery pack fitted, courtesy of Andy Nightingale(andyn)which fitted perfectly and worked first time...thanks Andy! Small is definitely beautiful!! 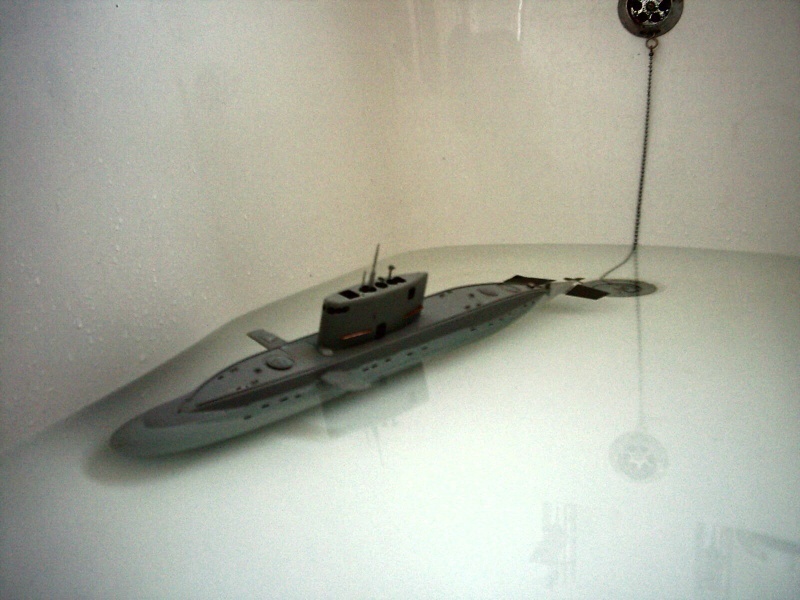 These little 1/144th scale kits are the way to go for those of us living in a small home, or who don't have huge workshops to build boats in, or are slightly less mobile than we were. Mine was built on an old school desk in my bedroom, with the bare minimum of basic tools, no power tools at all. They are easily moved around, easily transported in the smallest of cars to the lakeside...you only need a shoe box and you have a decent carry case for them. They really come into their own when used in small ponds and swimming pools, such as those we encounter at shows and/or displays up and down the country, and you don't really need sophisticated computer radios, fancy electronics or expensive commercial wtc's to operate them. 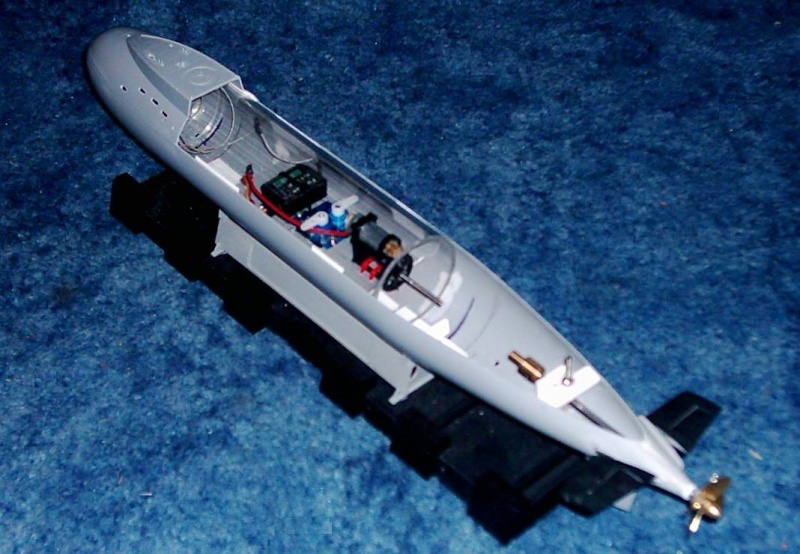 Another plus fact with building an operational boat of this size is that you don't need to carry a massive tool kit to a show with you...a couple of small screwdrivers, roll of insulation tape, tube of superglue, a set of miniature spanners, pair of pliers, and that's about it. 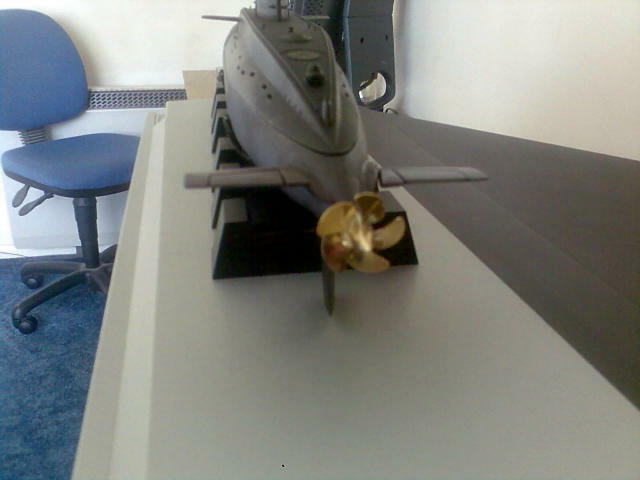 They are cheap to buy(the Kilo is listed on Cornwall Model Boats website at £16.00 at present)and are simple to build and convert, and provided you exercise caution when sailing and keep your eyes on them, they are great fun to use. The proper prop(pardon the pun...completely unintentional)arrived this morning...and what a prop it is too, well pleased with it. I like the prop - Raboesch are good and reasonably priced. 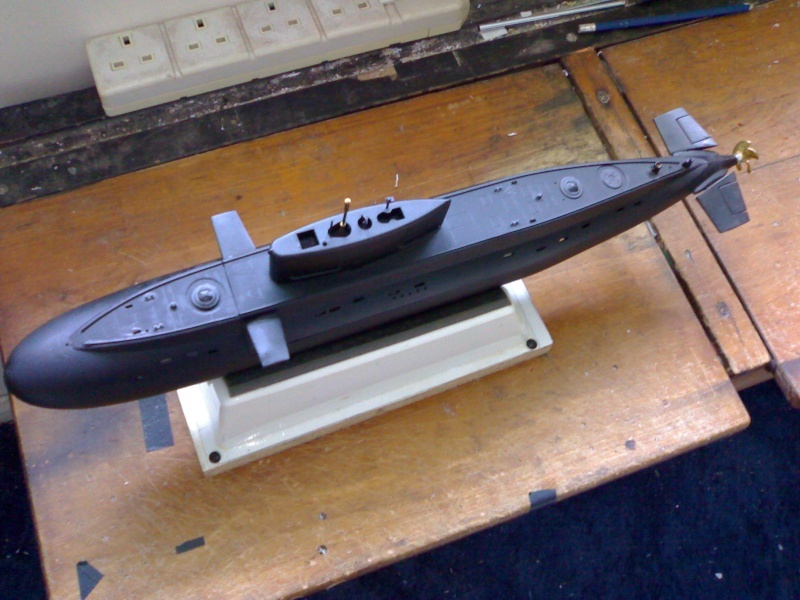 Will we...err...be seeing you with a 1/144th scale boat then, David? 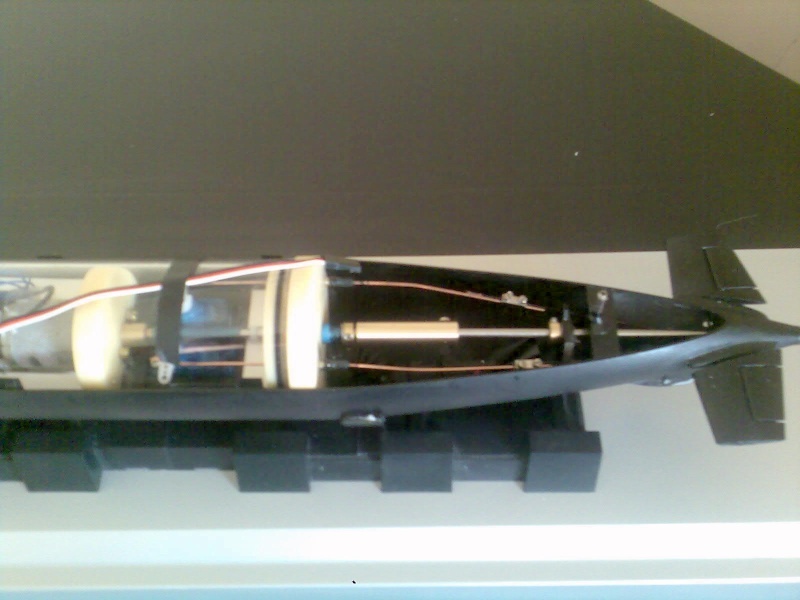 And this is the final internal set up, the battery pack is fitted as far forward as it will fit in the bows. The wtc is secured in position by a short brass pin epoxied through the hull bottom, that stops it revolving, and the solid brass coupling ensures everything stays where it's supposed to stay. The cable running over the wtc is the power lead from the battery pack, that then plugs into a lead running through the cylinder and acts as the charging socket and also the on/off connection, there wasn't room for a switch anywhere. You have don a beautiful work with that kit.You gave me courage and hope to cheap going on those difficult road of building models. I intended to read every post of you,to see everything you have don until now. Can you guide me to reach my goal,by send me in short eMail(PM) all you building post,Please!. THANK YOU for sharing from your knowledge with me. Oh Marius...I've built so many boats over the years I wouldn't know where to start with listing them all! 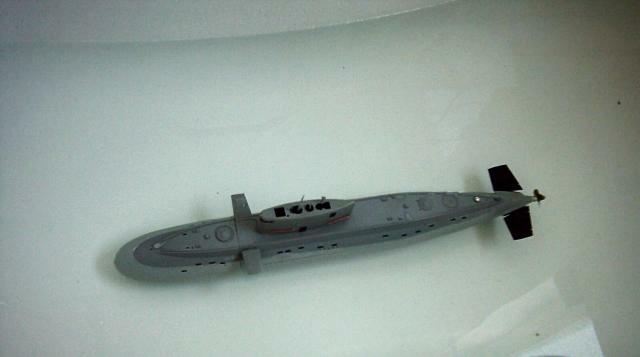 The submarines are on this forum...the Kilo, the USS Dragonfish (a converted Trumpeter Seawolf), Biber, the USS Theophilus P Rodenbough, U-117, my conversions to the Neptune, etc...all on here. 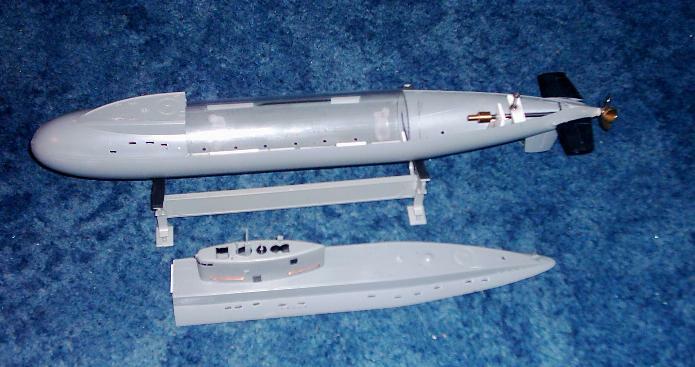 I did have a website about the Tamiya USS Enterprise aircraft carrier I built, and my USS Missouri battleship and RMS Titanic(all plastic kit conversions)but that's now been taken down. My other surface ships...over the last forty years or so I've built fast electric racing monohulls, 3 point hydros(outriggers), a steam launch, two tugs, a Sealink Ferry, a trawler, an outboard powered angling dingy, yachts, a canal barge, various cabin cruisers, a corvette...the list just goes on and on! I wheel look for them. 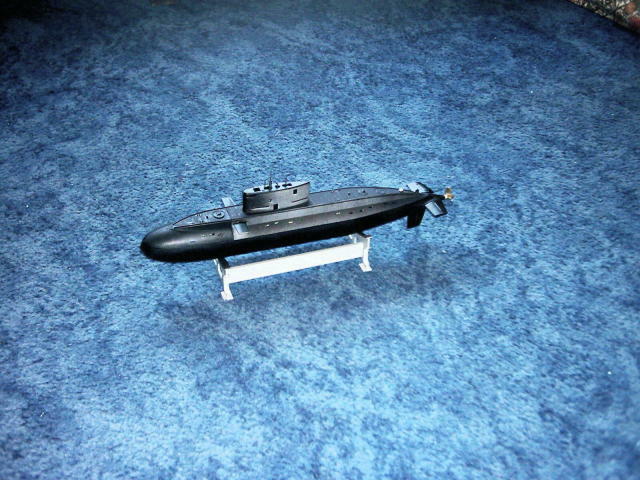 I intended to make a hall dossier about submarines and their builder to get notes about how to do it. The little Kilo has had a complete internal refit following a near disaster after a leak in the wtc. I've fitted a new 360 motor, a new Mtroniks Viper esc, a new 7.2v 1600a/h battery pack, and courtesy of Paul Holman, she now has a tiny little auto leveller fitted. 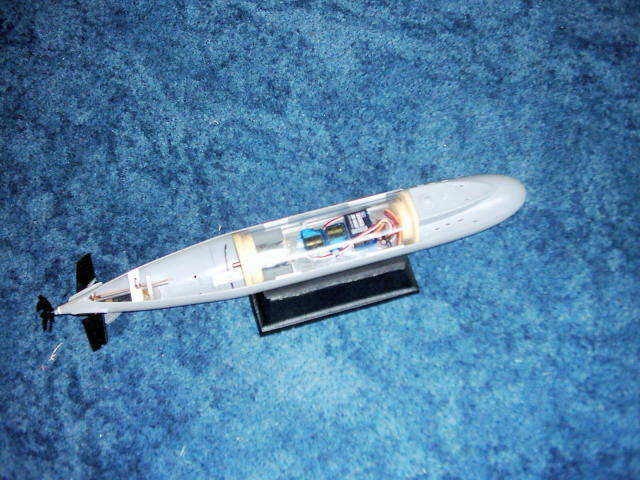 She also has a better coupling arrangement between the stub shaft and the prop shaft, and she's more or less for a ballasting and trimming session in the bath. Well, thank you kind sir...I tries me best. I'd like to be able to report that the Kilo sailed successfully on her maiden patrol...but I can't. Within minutes of putting her in the water she was getting lower and lower, so out she had to come...quick. 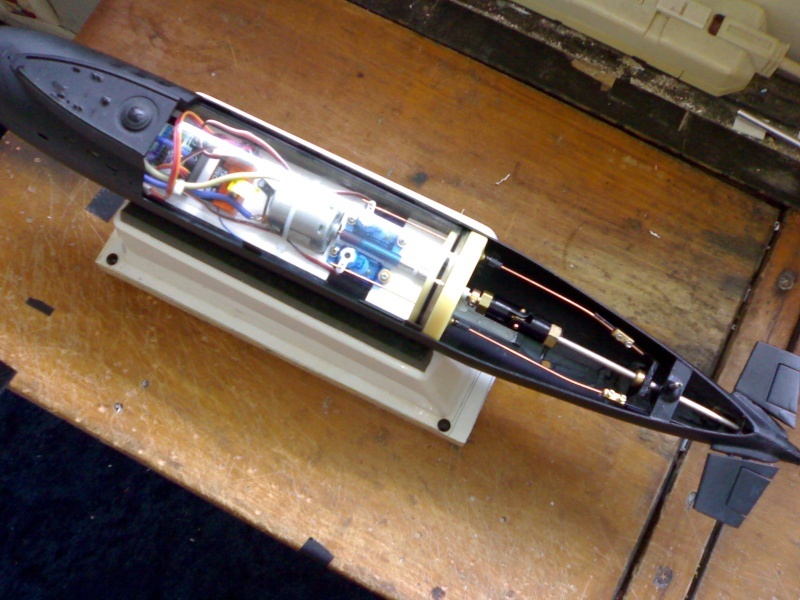 Water was coming in through the water tight prop shaft, so I had to dismantle everything again, drill the shaft tube out of the end cap, and make up a whole new one. I also replaced the Mtroniks esc with a Microgyros one...refitted everything, and I'm pleased to report that the Kilo is now wateright and ready to go again. This little boat has been a real challenge, but it's been worth it. Thanks mate, kind of you to say so. How's the Biber coming along? 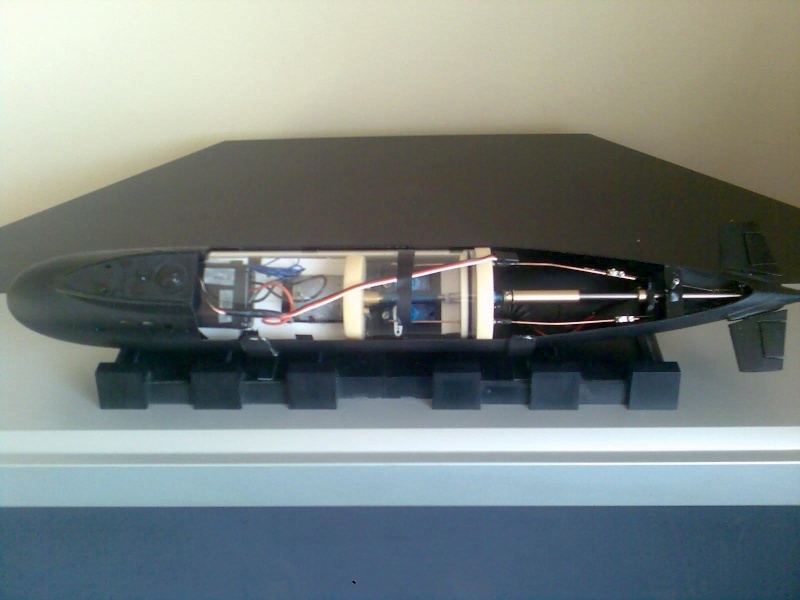 Had to make a few changes in the wtc, the battery pack (six sub-C 1600a/h cells) I fitted upset the boat's trim, so an alteration was called for. The Component Shop (www.component-shop.co.uk) are making me a six AA sized 2600a/h cell pack which will give me larger capacity, longer running time and it'll fit better in the confines of the wtc. The battery pack...exactly the same as mine, only mine will have a Futaba plug fitted. The equipment tray...bit cramped, but it does all fit. The little board on top of the esc is the auto leveller, courtesy of Paul Holman. 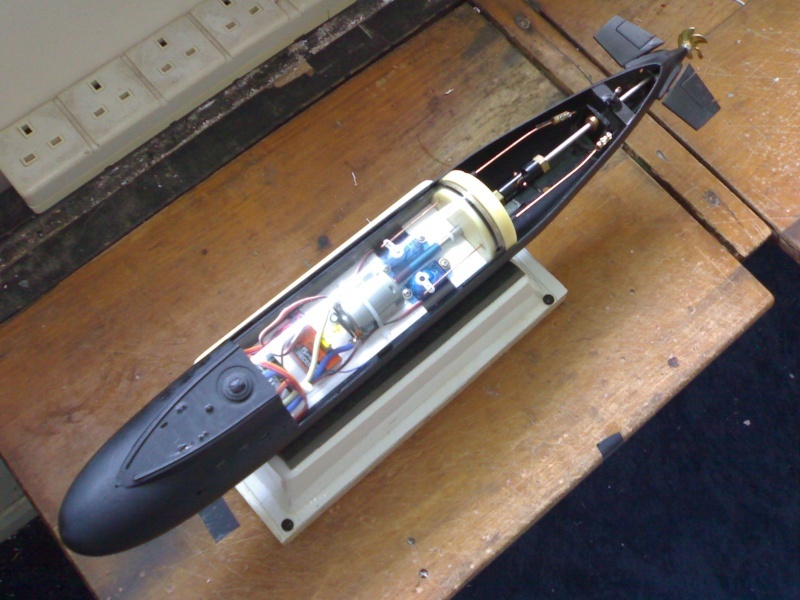 It works a treat, and has the benefit of being capable of being overridden by the tx stick, so should an emergency arise and I need to crash dive to avoid an accident with a surface vessel, I can do so by pushing the stick on the tx to 'planes hard a' dive. The tray in the wtc, the battery pack fits underneath...just. I know is an OLD Topic but maybe I'm lucky. 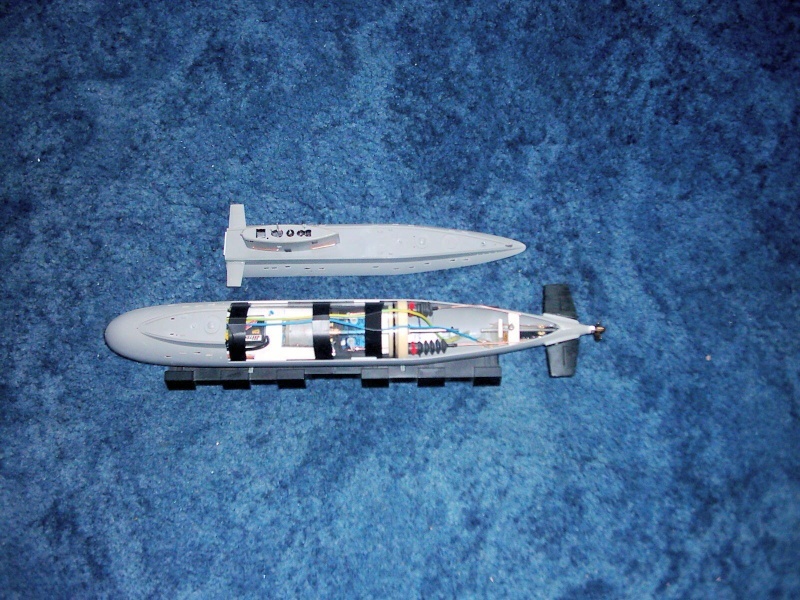 WHEN YOU'LL have some Spare time Do You think is possible to make some pictures as close is possible with the components for coupling the Ruder and Dive planes.How You can manage to do it in such small space?!?!. I am struggle to figure at out how to do it but NO luck until know.